With Alaskan Wilderness Outfitting Company, you'll experience incredible fishing, remote wilderness and some of Alaska's most spectacular beauty. All, in total comfort. We offer both guided and unguided trips to the pristine waters of Prince William Sound, the wild lakes and rivers of the Wrangell Mountains and the untamed wilderness of the North Gulf Coast. You choose the fish you want to catch and the accommodations you prefer, and we'll make it happen. We have several fully outfitted do-it-yourself trips, in tents, outpost cabins and floating cabins as well as full-service fishing camps and lodges. You can enjoy complete solitude, the camaraderie of a staffed fishing lodge, or a combination of both. We invite you to look through this brochure for the package that best suits you, your family, and your budget. If you don't see exactly what you're looking for, call us and we'll talk about putting together an adventure customized just for you. We can accommodate groups of any size for just about all of our packages and offer discounts for large groups. Fish for one or several of 14 varieties of game fish -- including five species of salmon, halibut, rainbow trout, steelhead, and Arctic grayling. Plus lake trout, cutthroat trout, Arctic char, Dolly Varden and red snapper. 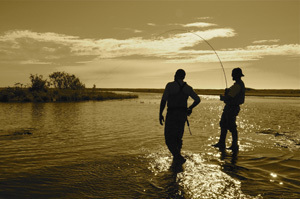 Whether you're fly-fishing or spin-casting, you'll come home with some unforgettable memories. Each of our locations offer a lot more than great fishing. There's always plenty of wilderness to explore and wildlife to see - by air, by land or by boat. With Alaska's extended daylight hours, you'll have plenty of time to do it all. In addition, we offer one-day fly-out options or combination packages. These maximize your fishing variety and the flights in themselves offer incredible sightseeing and wildlife viewing opportunities. 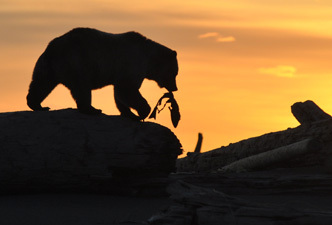 For the photographer there is unlimited opportunity to capture Alaska's magnificent scenery and abundant wildlife. For the adventurist, kayaking, hiking, clamming and flight seeing trips are available. About Alaskan Wilderness Outfitting Company We're based in Cordova, Alaska - surrounded by snow capped peaks, glaciers and clear running streams cutting through the dense forest. We're convinced, of course, that it's the most beautiful spot on the planet. We've been sharing these unique surroundings with visitors since 1982. We're family owned and operated - and we're proud to have built a reputation for taking care of our guests and to have repeat customers totaling 75% of our business. We'd like to make you one of them!! HOW TO GET HERE Cordova is located 150 miles southeast of Anchorage, with regular jet service from both Anchorage and Seattle. You can also take the state ferry from Valdez, Whittier or Seward. Cordova has several motels and hotels and we would be happy to make reservations for you, either before or after your trip. Restaurants, sporting goods stores and liquor stores are also available. Once you're in Cordova, we'll pick you up at your airport and take you to your motel or directly to your flight with us. The price of each package includes round-trip transportation from Cordova to your camp or cabin- plus any transfers you need to and from the airport and/or your hotel. MAKING RESERVATIONS Reservations should be made as early as possible to secure your desired dates. A 30% deposit is required; the balance is due 60 days prior to your departure. Reservations made less than 60 days from departure must be accompanied by full payment. Deposits are not refundable but are transferable to another package or to another person. Alaskan Wilderness Outfitting Company reserves the right to withdraw or alter any trips if necessary for safety or proper handling. Any additional lodging costs incurred by weather delays in Cordova will be your responsibility. Copyright 2019, Alaska Wilderness Outfitting Company. All rights reserved.